Solution for cases with limited bone: Neoss® short implants provide an alternative to bone augmentation procedures in cases with limited bone, such as severely resorbed ridges, proximity to inferior alveolar nerve, and sinus floor. Short implants eliminate the need for grafting in many cases and thereby reduce the invasiveness, healing time and cost of the treatment. Excellent stability can be achieved with short Neoss implants in cases with limited bone1, due to the unique implant design features. A three year study on 61 short (7 mm) Neoss implants shows that good initial stability (mean RFA 74.5 ISQ) was achieved, and that the stability increased significantly during healing, resulting in a low failure rate (4.9%). All short Neoss implants share the same robust prosthetic platform. It measures Ø4.0 with six internal rotational positions. 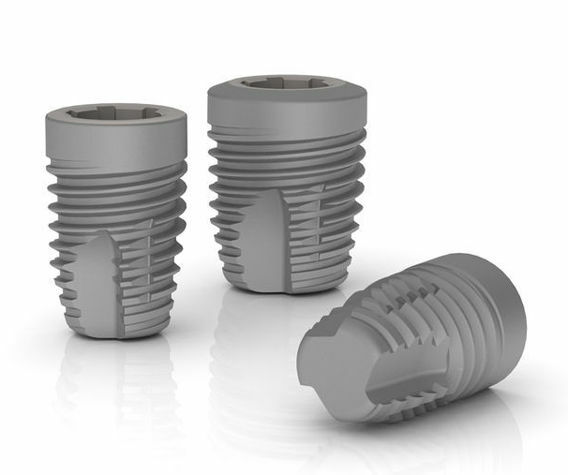 7mm implants are available in diameters Ø3.5 to Ø6.5. The implants are ‘double threaded’ for fast insertion and designed to achieve additional stability in poor bone quality. The Neoss Implant System incorporates TCF geometry by combining both Thread Cutting and Thread Forming (TCF) features. Thread cutting is provided by the primary cutting faces. The secondary cutting faces engage and improve cutting in dense bone. The Neoss ProActive surface is created by a multistage blasting, etching and super hydrophilicity treatment. This Surface treatment enables the implant to achieve a high level of wettability. The surface roughness is Sa 1.0μm over the fully threaded part of the implant and a reduced, Sa <0.4μm, over the flange (~2 mm) of the implant.